(MATT) So Chris drove til 1:30 am, then I (Matt) took over til 5:30am (added by an hour time change back to mountain time). Then Jon took over til morning. (He over heated once in the wee hours while we all slept.) When Sam and Chris awoke they couldn't believe how far we had journeyed, around 700 miles... not bad. All that distance was east, to get to Wyoming, pretty strange. Pocatello, Idaho. That was where we ended up. Then we got a grease job, the tire fixed, Jon and I changed the lower radiator hose, and then we did laundry. Next stop, Blackfoot, ID. 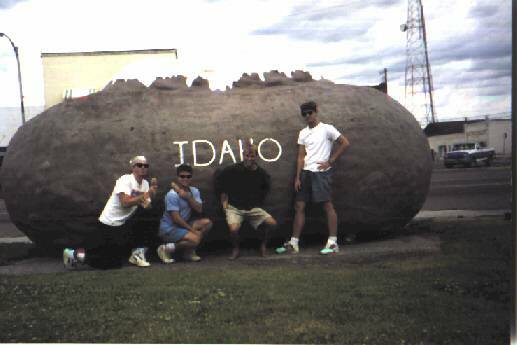 We had seen a billboard that read "Free taters for outta staters." Thus began our quest for free taters. Especially because it was nearly 3pm and we had eaten nothing. After much searching we found the taters place. We proceeded into the small building garbed in shades and "doo rags" on our heads. But the old man behind the counter was very friendly despite our odd appearance and after giving us free taters informed us that "round back" they give you free hot taters with butter and sour cream. They were great and we were happy. Chris laughed, then cried. We were then approached by a local who propositioned us asking us to please fill out a survey which we happily complied with. After this wonderful welcome, we left the state and drove into the Grand Tetons (strange name.) They were truly beautiful driving into one of the prettiest spots yet. The source of their beauty was thus: they had no foothills. They rose majestically 8,000 feet from Jackson Lake straight up. It was very very beautiful. We found a campsite in Gros Verde Campground and fixed dinner as it prepared to rain. We all attempted to use the phone to call our "others" (except Sam who had more important business to attend to. Sam's aunt had died so he had to call home.) But none were home. So we went to camp and climbed into the tent as the rain came and we chatted. Then I broke down and braved the weather to call again successfully. We talked for awhile about -CENSORED- and I was happy and sad. I laughed and I cried--The 33rd Day. That night we had much rain but we stayed dry.